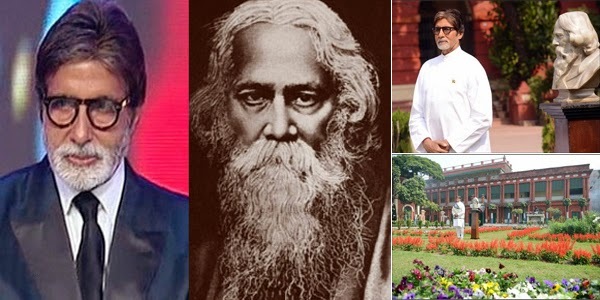 While the nation debated the fate of Bollywood star Salman Khan forgetting the 154 birth anniversary of Gurudev Rabindra Nath Tagore, eminent Nobel Laureate, poet, writer, painter and freedom fighter, there was just a single film star Amitabh Bachchan paying tribute to the literary genius, while the rest showing solidarity to actor Salman Khan! Readers may remember Amitabh Bachchan has great reverence for Bengali bard Gurudev Rabindra Nath Tagore. Recently while shooting for his upcoming film PIKU in Kolkata, director Shoojit and Amitabh Bachchan had shoot a video featuring the megastar singing 'Jana Gana Mana' at Jorasanko Thakur Badi. On the 150th birth anniversary of the Gurudev Rabindra Nath Tagore Amitabh Bachchan had sung the famous song Rabindrasangeet song Ekla Chalo Re … for the movie KAHAANI staring Vidya Balan and directed by Sujoy Ghosh. Bachchan had sung the song both in Hindi and Bengali. Readers may note this song was one of Mahatma Gandhi’s favorites, which was penned in 1905 by Tagore. Sharing his experience about the Rabindrasangeet Bachchan had candidly confessed, "May I just say that singing Rabindrasangeet for the first time was the greatest revelation. The beauty of the language, the lyricism of the tune and its dhun (music) are outstanding."